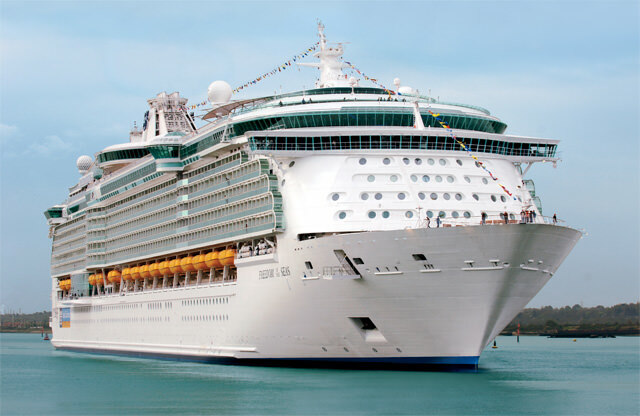 The 160,000-ton, 3,634-guest Freedom of the Seas and her two sister ships are essentially beefed-up versions of Royal Caribbean’s earlier Voyager-class vessels, offering everything those ships are famous for, plus several additional entertainment, sports, and shopping features. Like the Voyager ships, they’re busy and bustling, with a huge number of activities, great entertainment, and a really urban feel—like you’re stepping out of your stateroom into a real city. Freedom’s main drag is the Royal Promenade, a four-story horizontal atrium that stretches 445 feet down the ship’s center and is designed to resemble famous American entertainment streets like New Orleans’s Bourbon Street or Memphis’s Beale Street. Along its length, there’s an elegant champagne bar; a Ben & Jerry’s ice-cream shop; a 24-hour cafe; a pizzeria; six different shops; a comfortable English-style pub with seating inside or on the promenade itself; the cute little Cupcake Cupboard, serving fresh cupcakes at a la carte prices; and a Napa-style wine bar that offers wine-appreciation classes, tastings, and a chance to try dozens of vintages. Toward the bow, Pharaoh’s Palace offers live music, dancing, and entertainment. Royal’s older Voyager-class ships were already pretty amazing in terms of their sports and pool-deck facilities, but Freedom and her sister ships go several steps further. Up on Deck 13, there’s the same rock-climbing wall, basketball court, and miniature-golf course as on the Voyager ships, but there’s also a FlowRider surfing simulator, where powerful jets spray 30,000 gallons of water per minute up an inclined, wedge-shaped surface, allowing you to surf in place—or at least try to. Bleachers stand at the ride’s flank, letting family members and gawkers cheer you on. There’s also a free-standing “surf shack” bar to provide liquid courage or solace. Other notable spaces on board include while the beautiful, three-story Arcadia Theatre; a two-level disco called The Crypt; the huge Casino Royale; the Boleros Latin-themed lounge and nightclub; the elegant Viking Crown Lounge; and the cool Olive or Twist jazz club and martini lounge. 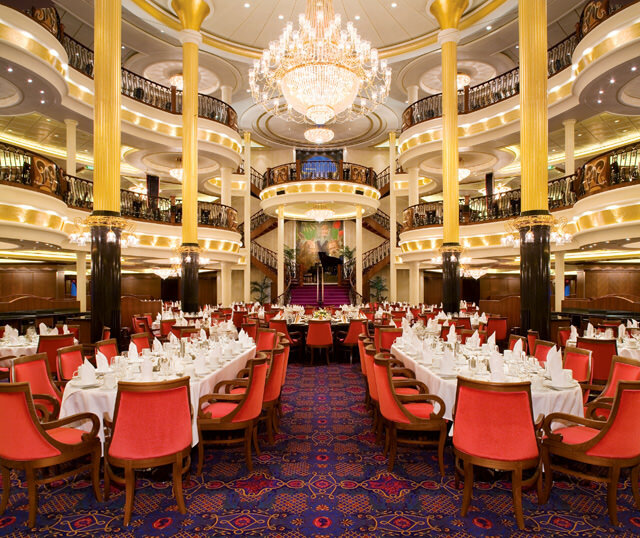 Spanning three decks, the gorgeous main dining room is the centerpiece of the ship’s culinary experience. Designed with classic European grandeur, it’s centered on a large open rotunda with a huge crystal chandelier, a formal stairway, and a balcony from which a pianist or piano trio plays mood music. 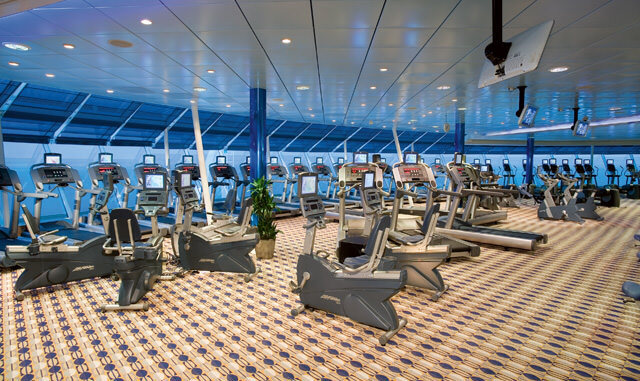 Just completed a cruise aboard the Freedom of the Seas and I’ve gotta say… this ship is AWESOME. While it may not be as big or as feature-packed as the Oasis, I still found that there was plenty on board to see and to do. The food was excellent (as always of RCCL) the crew was VERY hospitable, the bars were always flowing, the pools were spotless, the rooms (booked an interior stateroom, albeit somewhat small) were very comfortable, the casino was always lively, the shows were very entertaining – of course this list could go on and on and on. Th bottom line is, I had serious fun on this cruise ship and I’m almost positive you will have the same experience. The Post-Cruise Depression hit hard after this cruise, and i’m sure it’ll be a little while for me to overcome it. 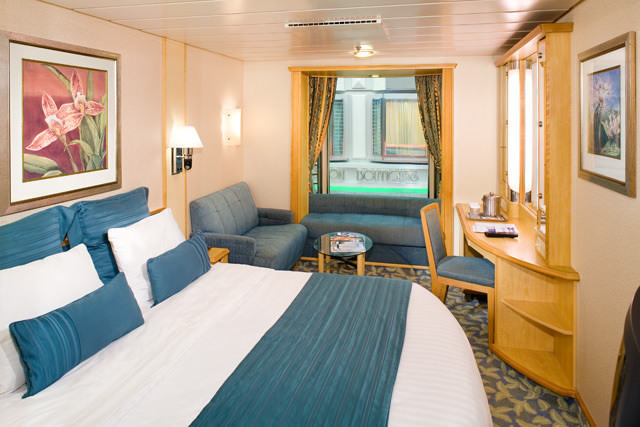 If you get the chance to book the Freedom of the Seas, don’t miss out on the opportunity! I HIGHLY suggest choosing a different ship/cruiseline. My friend and I went on Freedom of the Seas — our stateroom was covered in bedbugs and we got bites all over our bodies. After bringing it to the attention of the cruise staff, we were disregarded and disrespected. Turns out, many other people on our hall also dealt with bed bug bites. This entire cruise was extremely disappointing and obviously uncomfortable. From the bugs the bites, to the lack of respect, to the pitiful communication amongst crew members. My friend and I were humiliated, painfully uncomfortable and had to go to ridiculous lengths to receive respect and empathy. This was the last way we wanted to spend our hard earned vacation days and money after going out of our way to book with Royal Caribbean. Our trip was a waste of time and good money. On top of the pain and discomfort of the bugs we missed meals,missed excursions and were generally miserable because of the way we were treated aboard the ship. We promptly contacted Royal Caribbean after our cruise and they had the nerve to send us 2- $100 off your next cruise vouchers. Pathetic!